9 May 2017, at 12:00a.m. 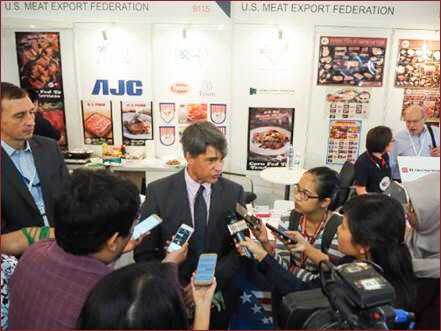 INDONESIA - Continuing its work to set US beef and pork apart in an increasingly competitive Indonesian market, USMEF showcased products, offered tasting samples and hosted a US meat barbecue reception at Food and Hotel Indonesia, the country’s largest food and hospitality event. 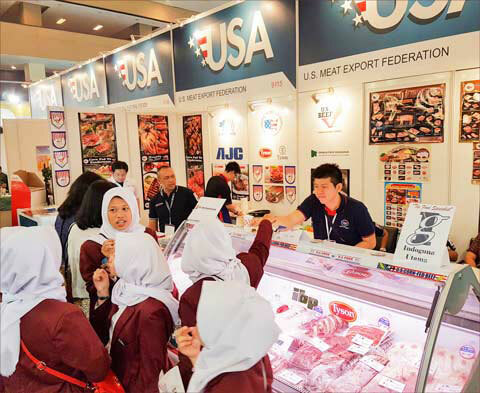 USMEF’s efforts at the show, which attracted more than 30,000 visitors to Jakarta’s International Expo Kemayoran, was funded by the USDA Market Access Programme (MAP), the Beef Checkoff Programme and the Pork Checkoff. Sabrina Yin, USMEF-ASEAN director, said demand for red meat is growing in Indonesia – but evolving governmental policies and a growing list of competitors make it vital that US red meat continue to highlight its positive attributes to Indonesian consumers and importers. “A show like Food and Hotel Indonesia, where the country’s foodservice sector has such a strong presence, is a good place to demonstrate the advantages of US red meat and learn about other countries that are beginning to export meat into the market,” said Ms Yin. The event, held in conjunction with the Salon Culinaire chef’s competition, featured country pavilions from the United States, Australia, Libya, Turkey, Korea, Taiwan, Belgium, Singapore, China, Hungary and Germany. USMEF’s exhibit inside the USA pavilion was extensively decorated with signs and posters promoting US beef and pork. Among its visitors was US Deputy Chief of Mission Brian McFeeters of the US Embassy in Jakarta. US beef items displayed at the show were USDA Prime tenderloin, striploin and ribeyes, Choice tenderloin, striploin, brisket, boneless short ribs, top inside round and ribeyes, along with finger meat and outside skirt. US pork items displayed were tenderloin, spare ribs, back ribs, skin-off bellies, smoked brats and garlic brats. According to Ms Yin, recent data from Indonesia’s Central Statistics Agency indicates that Indonesia’s national beef production capacity this year will top out at just over 468,000 metric tons (mt), while total beef consumption is expected to reach nearly 730,000 mt — a potential 262,000 mt deficit. “Indonesia is trying to boost local beef production through several initiatives, but for the foreseeable future it will rely on imports to meet the insatiable local demand,” said Ms Yin. Thus the rise in competition on the beef side. Indian buffalo meat, which has a growing presence in Indonesia, was represented by a booth at the Jakarta show. 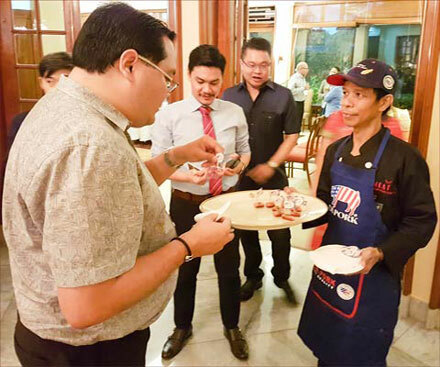 Held at the residence of US Ambassador to Indonesia Joseph Donovan, the reception attracted 85 traders, foodservice company representatives and chefs. Mr Donovan gave remarks on the Indonesian market, while Joel Haggard, USMEF senior vice president for the Asia-Pacific, summarized USMEF’s work on market access issues. The reception also provided a platform for US exporters who participated at Food and Hotel Indonesia to meet importers who were unable to attend the show. To keep customers interested in US beef and pork engaged, chefs who had attended USMEF’s recent culinary program in Singapore were also invited to the reception.